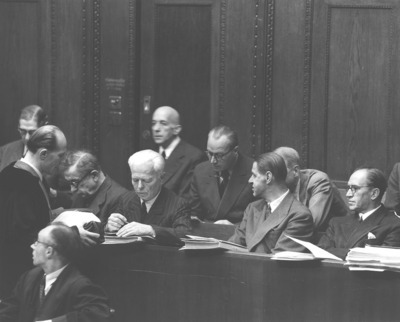 White-haired August von Knieriem, defendant in the Farben case now before Tribunal Six at Nurnberg War Crimes Trials, shown checking portion of his defense documents with Friedrich Silcher of Berlin, assistant counsel in his defense. Other former officials of the I.G. Farbenindustrie shown during this recess photo include Wilhelm Mann, Fritz Ter Meer and Christian Schneider.